I bought my IP power port from OpenXtra in the UK. Denis was really helpful and I was able to specify that I wanted 2 pin EU plugs all round, both for the main power supply and on the IP power switch module. 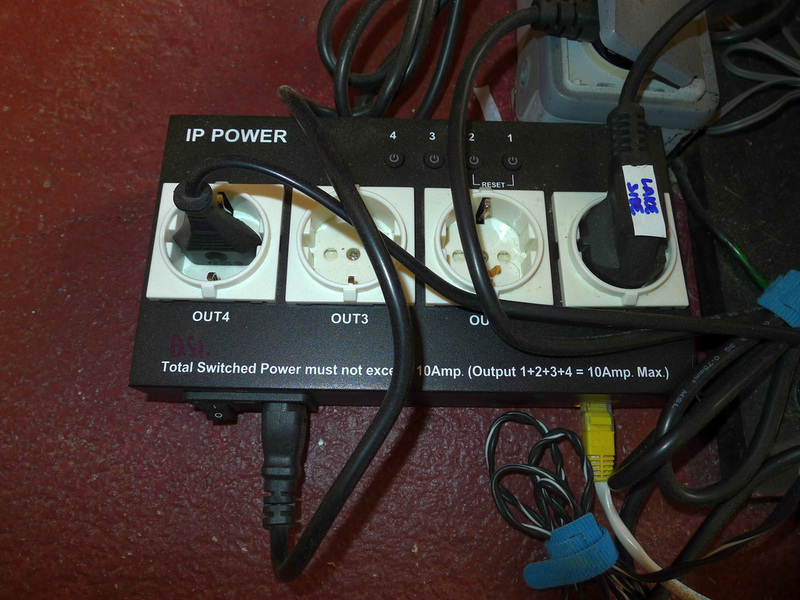 What is an IP power switch and why do I need one? This IP Power switch is designed to plug into a router (or you can get wifi ones) and through your network it will allow you to switch on and switch off plugs from a PC or now also a phone or tablet. I needed one as I am controlling all of my equipment in the observatory via the remote desktop program on my laptop from the house. I have a separate NUC (small PC) in the observatory that controls all of the equipment running and so I need a way to be able to turn the equipment on and off. I have gone for a 4 plug switch as I have divided up the equipment so that I can turn it on independently - There are times for example when I just want the computer on and nothing else. Here is one of my switches. There are many alternatives out there but I thought that it would be worth saying why I went for this specific version.... it may strike a chord with someone if they are thinking of the same thing. I didn't want ANY sort of WiFi device as WiFi has the potential to be a little flaky and lose connection (certainly mine does!) whereas with a hard wired connection I felt this was going to be much more reliable. This device plugs straight into my switch gear in the observatory that is hard wired with Cat6 cable to the router in my house. I didn't want to mess around changing plugs and mess with power. There are some good C14 plug versions out there, but that would have involved me changing all of my plugs over. There are some where you can wire them directly into the unit..... again as someone with little or no electrical knowledge I felt that for me a simple plug in device would be the best option. The switch was in the box, along with initial set up instructions and a CD with the Aviosys controlling software. It didn't come with an ethernet cable to plug from the switch to the router, but these are easy to get hold of. The software it comes with is IPEdit and this needs to be run in order that the device is recognised. There are a lot of possible devices within the edit software so it's important to make sure that you select the right one. The instructions that are sent with the switch are easy enough to follow and certainly easy enough for me to get the switch all set up. A disc loaded with the IPEdit software comes with the switch, but it can also be downloaded from the Aviosys website. Once the software is loaded and the device is recognised then you can begin to assign the individual switches to various equipment. I have the software set up on my PC that I work from the house, and that way I can switch the equipment on as needed. This is a screen grab of the software and you can see that there is room is name each of the switches. There's also a timer facility should it be required and in the set up and power controls tab down the left hand side there is all manner of options - None of which I have explored as I don't need anything beyond a simple on and off switch. I have the software set up so that there is a short cut on my desktop. Once I click on that then the screen grab below opens up and I can begin to use the Power switch. All I need to do is click the 'on' control on the appropriate power switch and then it will power on. If you are by the switch you will hear a beep as it switches on, There's a slight delay in them, so I have learnt to give a little time between switching everything on. 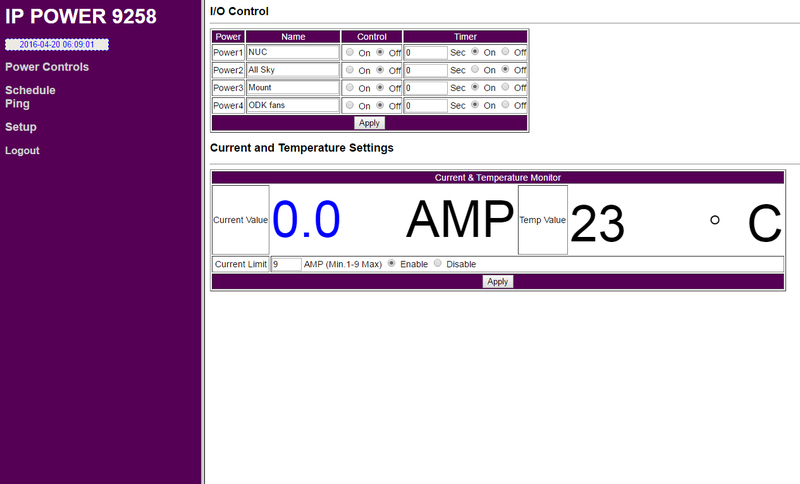 The newer software also has a current and temperature monitor.... again something that I have not had use for. At the end of the imaging run (normally in the morning all being well) I click on the switch shortcut on my desktop, the above screen opens and then I click on the 'off' control. Then everything is switched off. I do have my NUC in the observatory set up via the bios to switch on automatically once it is powered up. That way I don't have to physically go to the observatory and turn it on. These switches are an excellent way to ensure you can have total electrical control over your equipment without having to go to the observatory. This can be absolutely crucial in a remote set-up where you are unable to go to the equipment.